All photos by Bart Koscinski for Bushwick Daily. Wine and food are often seen as an obvious paring, but I feel like beer and food seems to get a bad rap, if it's not ignored entirely. But beer and food are logical mates. As manager of Hops and Hocks Blake Jordan says, "Beer has more complex food flavors. It's ingredients are closer to the earth." It can also be easier to drink beer with spicy food since the tannins that give wine its bitter aftertaste don't make it easy to pair with hot Latin and Asian flavors. This week I teamed up with my good friend Mark Owen to bring you a food and beer dinner that you can recreate in your own home. Mark, aka the Urban Food Guy, writes a popular food blog where he dissects urban food culture and treats readers to his own delicious recipes and tips. Last Sunday, Mark did the menu and I selected the beers to pair. 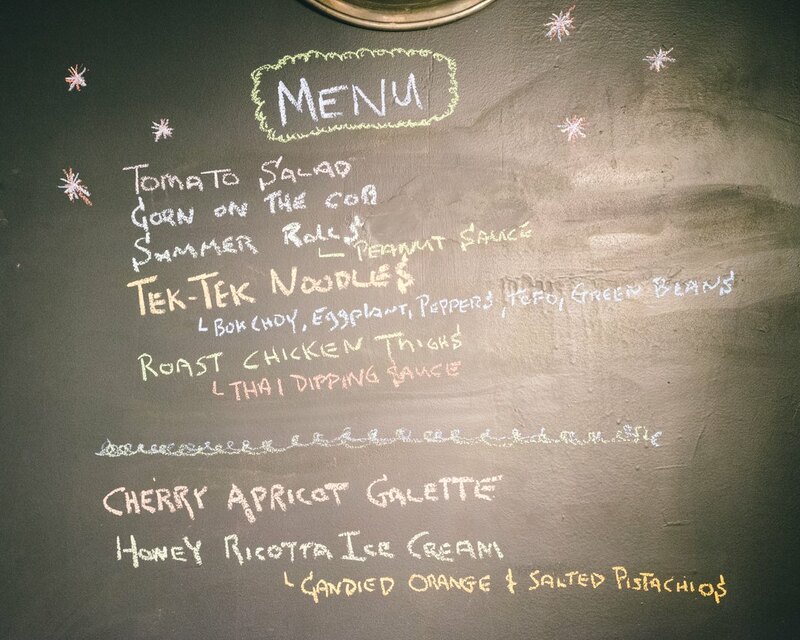 Mark made a spicy, savory, Asian-inspired menu and, with the help of Blake, I chose some funky Belgian beers from Hops and Hocks with plenty of funk and flavor to compliment the menu. 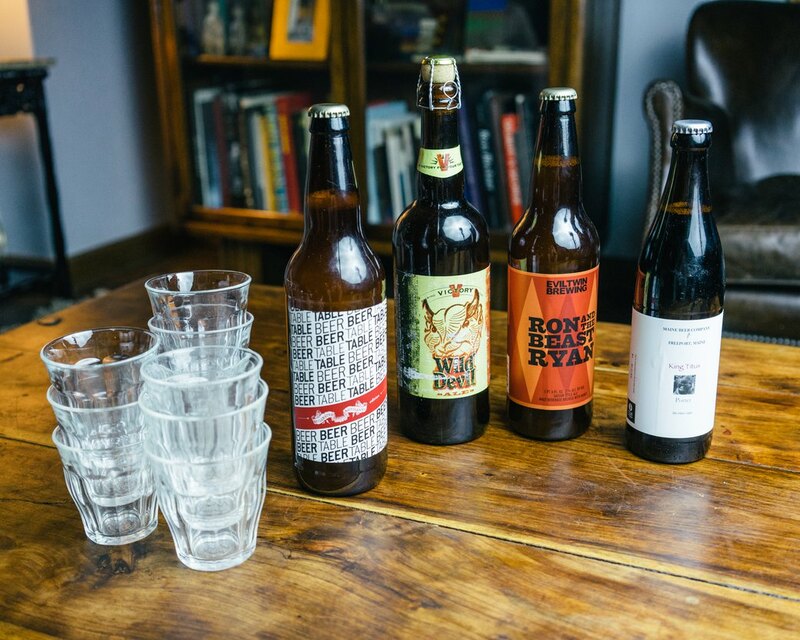 You can read about the beers below and find all the recipes on Mark's blog Urban Food Guy. Mark's easy tomato salad keeps to a light and simple dressing to really highlight the tomatoes that are so lovely and in season right now. The Ron is a saison with lots of fruity hop flavors and an aroma heavy with citrus, tropical fruit, and that special, honey-ed Belgian funk. It's tropical fruit flavors--mango, tangerine, orange--pair nicely with the earthy acidity of the fresh heirloom tomatoes in the salad, for a great summer starter. These summer rolls are light and flavorful, especially when dipped in the delicious peanut sauce that combines some interesting and not entirely Asian ingredients to build its complex flavors. There's so much going on with the food that it's good to keep it simple with the beer. Stillwater's Table Beer is complex, but relatively subtle with its flavors. It's fairly heavy on the Belgian funk for such a session-able brew (it's only 4.7% ABV), with a lemon-citrus aroma and flavor, some bready malts, and a bit of a spicy finish that compliments the peanut sauce. Main course for dinner was a wonderful combination of flavors, textures, and foods, complimented by Victory's smooth Belgian IPA that even the least beer-inclined among us found highly drinkable. The peanut-y, savory noodles were enhanced by a delicious veggie mix, roasted chicken thighs, and a thai dipping sauce with plenty of heat. To counter it, the Wild Devil has a relatively strong malt profile--keeping it a bit roasted and caramel-y--but never forgetting the Belgian spice to lend tang and complexity or the citrus and floral hops that keep this in IPA territory. A really well balanced beer that can take on a main as diverse and flavorful as Mark's Tek-Tek Noodles. Mark is a dessert expert and a master at knowing just what dessert you're craving. 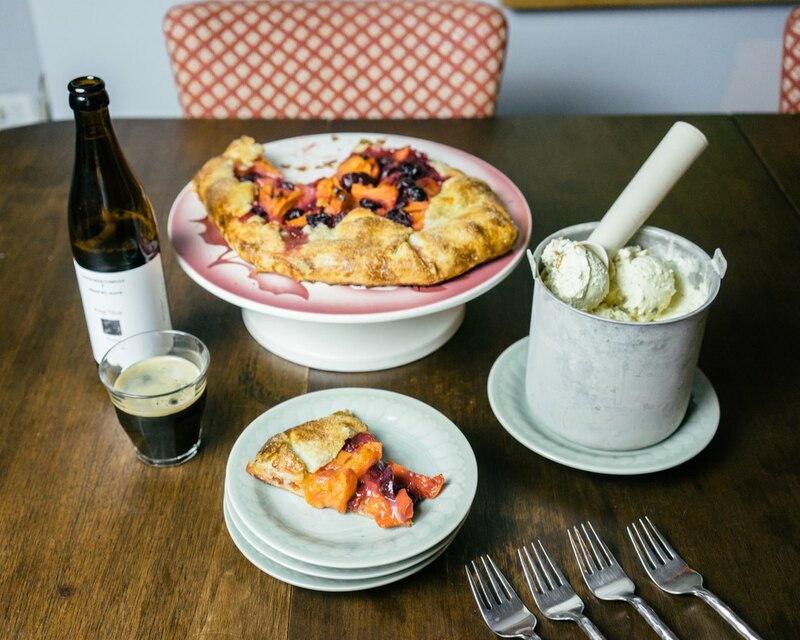 And at the end of the summer, nothing could be more satisfying than a fresh fruit tart with a side of homemade ice cream. And if Mark knows one thing about me it's that I love excessive amounts of salt in everything I eat, in particular my ice cream. This dessert went above and beyond, and the sweet and fruity flavors went wonderfully with the King Titus Porter. On the nose and first taste the beer is all you can want from a solid porter: roasted cocoa and a bit of coffee, with a creamy full body and lots of deeply toasted malt. The coffee and chocolate drive it home all the way to a finish, giving bitter richness and acidity to the dessert experience. 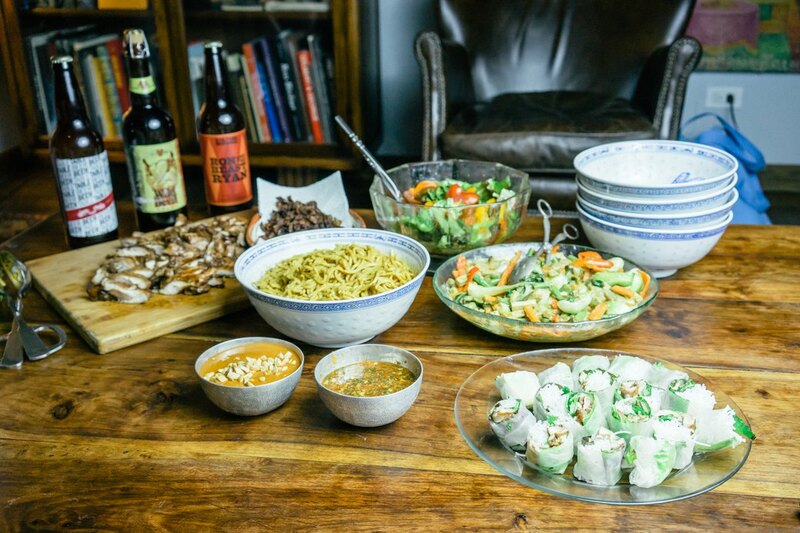 Beer and food pairings are a fun way to kick a dinner party up a notch and are sorely underrated as a serious culinary endeavor. Of course, our dinner was casual and fun, but I never eat better food than with Mark, and the beers curated by Blake Jordan from Hops and Hock's bountiful selections elevated the food even further. Make sure to check out Urban Food Guy to get the inside scoop on all the scrumptious recipes from Mark and to stop by Hops and Hocks next time you're doing a pairing dinner of your own!